John McWhorter PhD Linguistics (Stanford). The Power of Babel (2003). p. 241 Middle. Milton's it (in green) feels ambiguous and bungled. He ought to have rewritten the referent, as I would've never deduced it without McWhorter's clarification beneath. Yet Milton would've known not to use a pronoun, as he was canny enough to predict if this ambiguity would daze his readers. So why didn't he regard this as a blunder? Why didn't this ambiguity bewilder his readers, as it does me? The pronoun it does not seem "bungled" to me at all. It is a little distant from its referent, true, and the reference is not to a simple noun but to a composition of noun phrases; but if you're following the argument there's no difficulty at all. I would have liked to see and slays or slaying. They could write just fine back then, dude. As to why you're bewildered: ideas must be your terra firma, not individual words. Just as which can refer back to the idea expressed in a prior clause, so can it. Even if you find the antecedent to be unclear at first glance, the referent is impossible to miss. What persecution, how we spill, this kind of homicide or martyrdom or even massacre -- all of these are characterizations of some single underlying class of action. They all share a referent. There is an obvious difference between "persecution" and "homicide". The two words here do not represent their shared referent in the same way. As presented, not all persecution entails homicide and even less entails massacre, but some may, which is reason enough to be wary. In those cases, the massacre is an escalation of a martyrdom which itself is an escalation of a homicide that in turn began as mere persecution. It might be fair to claim that seventeenth-century readers were far more accustomed to this rhythm of prosody than to the sound-byte staccato of the MTV and Twitter generations. It might also be fair to claim that the pronoun in question would be too self-referential for comfort unless its antecedent lies outside the clause surrounding it. 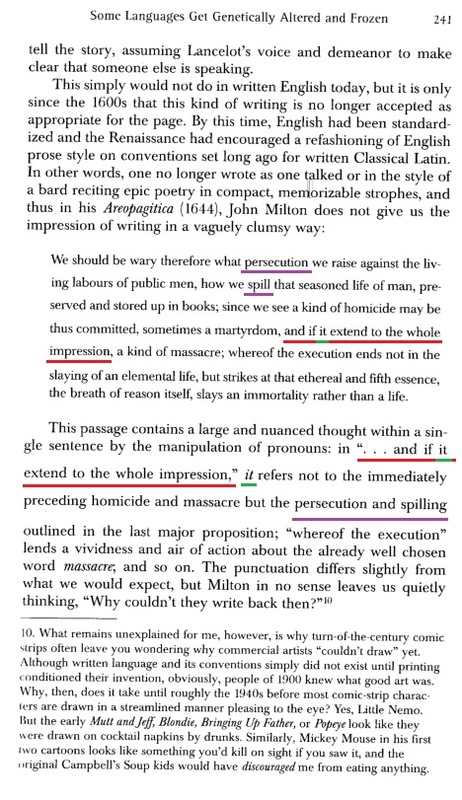 It might even be fair to claim that Milton never expected his audience to grasp his meaning in a single pass. All of that hardly matters. We can assume that Milton was canny enough to know when all roads lead to Rome. It makes little practical difference exactly how far back the reader reaches to find the antecedent. The semantics of the sentence as a whole remain intact. There is no blunder here, and little if any cause for bewilderment. Even if a technical ambiguity exists, it doesn't stand as a meaningful ambiguity. Those antecedents that make any kind of sense all make pretty much the same kind of sense.